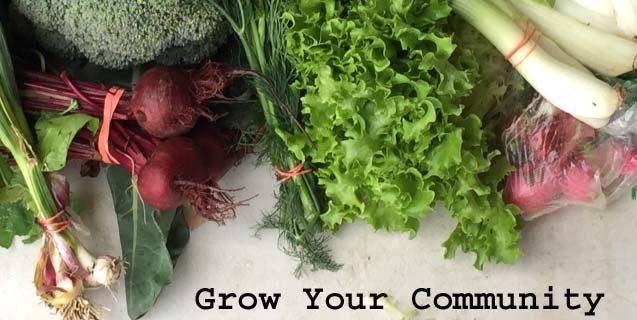 Community supported agriculture (CSA) supplies yummy produce we have come to love: tomatoes, broccoli, lettuce, cukes, etc. Locally grown veggies can’t be beat, but variety is the spice of life .. especially when it’s coffee and chocolate! Unless you live in Hawaii – there’s no such thing as locally grown coffee and chocolate. We’re Singing Rooster, a social enterprise nonprofit; we open doors for Haitian farmers with your help. 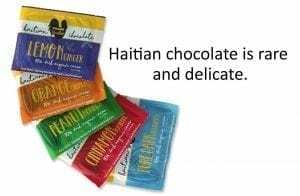 We wholesale Farm Direct Haitian coffee, chocolate, and roasted cacao nibs to CSAs. You win by adding quality products from third world farmers to your shares, and Haiti’s small producers win because they’re selling crops through Singing Rooster (we take no cut and support them in other ways). The Math : 100 shares + 1 bag of coffee = $2,760 in 8 weeks. Now add in chocolate, and your profits grow by $1400. 80% of adults drink coffee & most of us love chocolate–both easy add-ons. 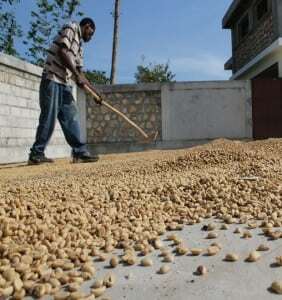 Haitian farmer drying coffee beans. 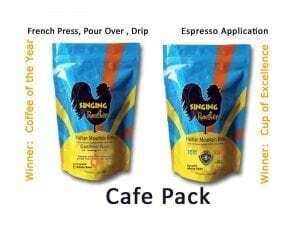 Create a wholesale account and order an at-cost cafe pack (2 full sized bags of our premium coffee). We also have at-cost chocolate & roasted cocoa nibs full sized samples. Leverage our Work w/ Customers : we work directly with Haitian coffee and cacao farmers to create quality products and create direct market access for farmers. We pay $3 minimum per pound to farmers upfront and return another 50 cents after coffee sells. This is almost twice as much as is required by Fair Trade. We train in small business management and agriculture improvements. Haitian coffee is excellent – they’ve been farming coffee for 250+ years and were the world’s 3rd largest supplier in 1949. They need a hand up in getting direct access to markets. Take the one step further. 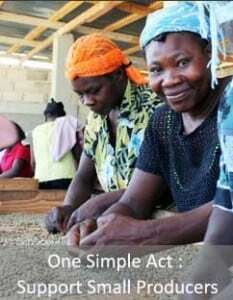 When you purchase coffee from Singing Rooster, you make a profit AND help support Haiti’s farmers. Join us in extending the farmer-to-table revolution. Wholesale chocolate – creamy, rich, dark, 70% cacao (35% margins). Farmers supporting third world farmers through Singing Rooster. Join us.